Present state: Down platform largely intact but overgrown; up platform survives in degraded condition; Midland Railway lamp standard on up (Skipton-bound) platform; station house, greatly extended, set back from up platform. Notes: Thornton-in-Craven is an attractive stone-built village on the Skipton-Colne road (A56). Historically the road route between Skipton and Colne was on the moors to the south-east, and a minor road passed through Thornton. In 1824 the Colne to Broughton turnpike was opened, and 24 years later the railway was built between Skipton and Colne, passing about a quarter of a mile south-east of the village. Thornton station opened with the line. To distinguish it from the GNR/LNER Thornton station near Bradford, ‘-in-Craven’ was eventually added to the name, but this was a sluggish process: the suffix appeared in Bradshaw’s index by August 1887, though not in the timetable. The Railway Clearing House Handbook of Stations 1904 calls the station Thornton-in-Craven but it was not until 27 September 1937 that the LMS timetable gave the station this name. The station had facing platforms on the double-track railway. 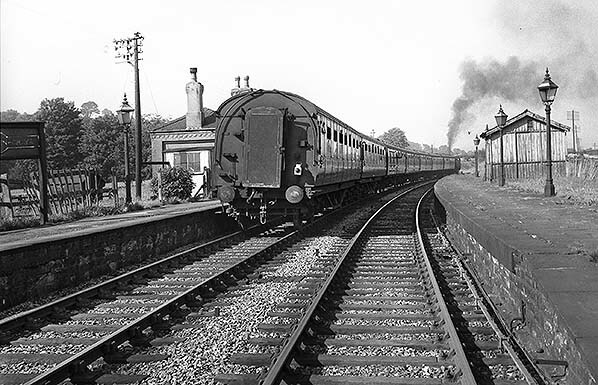 The main building on the up (north-west) platform contained the booking and waiting facilities and was of the same style as that at Elslack, the next station towards Skipton. It was of brick construction, a single-storey structure of modest dignity. The roof was hipped and the door and window openings were segmental arches. Some decoration was supplied by dentillation of the cornices. On the down platform was an austere timber-built, enclosed waiting shed with a pitched roof. Platform lighting was by oil throughout the station’s life, the casements supported by standards bearing the Midland Railway’s initials. Map evidence indicates that the station house was built between 1894 and 1909. It was well set back from the up platform, adjacent to Station Road. Its design was uninspired: a two-storey building probably of brick, and rendered, under a pitched roof. A single goods siding and a cattle pen were at the rear of the up platform, with access from the north-east. The RCH Handbook 1904 records that livestock and horse boxes could be dealt with in addition to routine small goods traffic and that Spencer’s Permanent Way quarry was served by rail. There was no crane at the station and it is thought never to have possessed a warehouse. The signal box was about 200yd north-east of the up platform ramp. P W Spencer’s limestone quarry was about 600yd north of Thornton station. Its extent and details of its railway link and track layout can be seen on the accompanying OS map of 1896. The dates of its opening and closure are not known, but Binns (2008) assumes that it lasted until the 1920s or ’30s. The single-track railway into the quarry was accompanied by a loop and network of sidings close to the main line, north of which it passed over a lane on a stone arch. Beyond the bridge was a short loop then a tunnel under the Skipton-Colne road from which the railway emerged into the quarry. In 1863 there were five departures in each direction on weekdays and two on Sunday, most of the trains between Skipton and Colne calling at Thornton. Destinations of trains are not always clear in Bradshaw. By 1887 the frequency of train calls had increased both on weekdays and Sunday. In January 1923 when the ‘Big Four’ Grouping took place the Midland Railway became part of the new London, Midland and Scottish Railway (LMS). It was under LMS management that the station formally became Thornton-in-Craven, and the company installed its distinctive ‘Hawkseye’ nameboards carrying the full name. During the 1920s and ’30s competition from road motor transport increased, and buses could serve Thornton directly, and the station’s location some way from the village proved to be a disadvantage. The 1938 timetable, below, indicates that trains ceased to make evening calls at the station, with the exception of the 6.45pm down departure on Sunday. The lonely lane between the village and station might have been a deterrent to would-be passengers at that time of day. From January 1948 the LMS railway network in England and Wales formed the nationalised British Railways’ London Midland Region. Under this management Thornton-in-Craven station’s goods services ceased on 30 July 1951 and the adjacent Elslack station closed in 1952, followed by Foulridge in 1959, leaving only Thornton and Earby in use on the Skipton-Colne route. 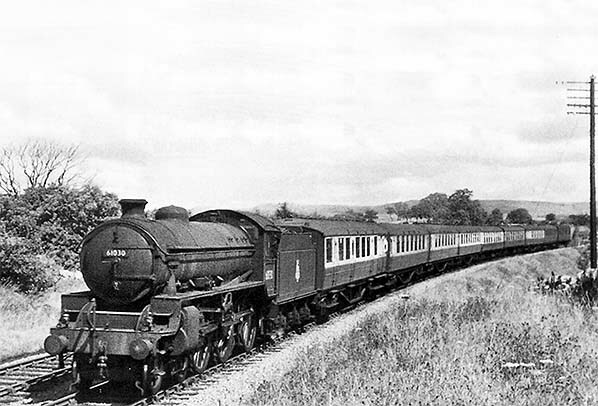 It is noticeable in the summer 1958 timetable that Foulridge enjoys a more frequent train service than Thornton, although it was Thornton that would remain open until the line closed. On Monday-to-Friday, Thornton’s service is morning and early evening only, but some Saturday-only trains stop at Thornton between these times. No trains run on Sunday. Only six months after Foulridge closed, in June 1959 Thornton-in-Craven was included in a lengthy list of lines and stations that the London Midland Region proposed to close by the end of the year (reported in Railway Magazine, July 1959). Other threatened services in the area were the Wigan-Chorley-Blackburn and Blackburn-Hellifield lines and Pleasington, Huncoat, Entwistle, Turton & Edgworth, Bromley Cross, Haslingden, Gargrave and Long Preston stations. Curiously, the Earby-Barnoldswick Branch, with its dramatically curtailed train service, was not in the list. The March 1960 Railway Magazine reported that some of the threatened stations would, after all, be spared; Thornton-in-Craven was not on this list, but somehow it avoided closure. Having successfully escaped extermination in 1959, the Reshaping of British Railways (‘Beeching Report’) of March 1963 recommended Thornton-in-Craven’s closure whilst sparing the Colne Branch; predictably, the service from Earby to Barnoldswick was listed for withdrawal. The residents of Thornton-in-Craven seemed unmoved by the possibility that their station might close with the Craven Herald reporting that people found buses far more convenient because of the distant situation of the station. Many threatened stations were to close within three years of the report, but Thornton-in-Craven cheated the executioner once again and remained open and staffed throughout the 1960s. However, with its future uncertain no investment was made in the station, and by the mid 1960s its appearance had become distinctly shabby. The shelter on the down platform had been removed and most of the lanterns disappeared, leaving a row of decapitated columns. British Railways nameboards were not fitted, and at least one of the LMS boards lay on the platform for some time having fallen from its frame. The summer 1964 timetable shows a threadbare service; the down Saturday-only departures are daily weekday trains which omit calls at Thornton on Monday-to-Friday. No trains call on Sunday. While British Rail dithered regarding the future of the Colne Branch, deciding in 1966-67 to retain it as the only passenger railway access to Skipton, then reversing this plan, Thornton-in-Craven seemed to ‘pass below the radar’ and its closure did not take place until the line closed on 2 February 1970. The final public timetable to show Thornton’s train service was the May 1969 edition, by which time the up service had shrunk to two weekday calls. The earliest departure of the day to Skipton is too late to be of use by scholars and many workers. After closure the railway tracks were swiftly removed, probably by summer 1970, and by 1973 the station building on the up platform had been demolished. The station house, standing apart from the platforms, remained in residential use. This building was of little architectural interest, but it has been extended with great skill into an attractive house which looks authentically Victorian. The down platform remains largely intact, though overgrown. The up platform is less well defined, but one of the Midland Railway lamp standards has survived. The trackbed through the station site is a public footpath. Several hundred yards north-east of the station the route of the siding into Thornton Quarry (locally known as Thornton Rocks) can be followed across the bridge over the old road to Skipton as far as the tunnel portal. The abandoned quarry can be reached by a steep footpath through the woods west of the A56. The quarry is flooded, apparently with some equipment in place below the water, and it is popular with divers. The north portal, where the tunnel emerged in the quarry, is still visible but access to it requires both care and courage. Thornton station looking north-west c1906. This unusual angle provides much valuable information about the buildings and fixtures as well as the site of the station in relation to Thornton village, seen on the hill in the distance. The single-storey station building, constructed of brick under a hipped slate roof, is on the up (Skipton-bound) platform; although it possesses modest dignity it does not look entirely at home in a landscape of rustic stone houses. The back of the timber waiting shed with its pitched roof is seen on the down platform. The two-storey stationmaster’s house, with smoke issuing from its chimneystack, is seen far left. It is an undistinguished building constructed c1900. The running-in nameboard gives the station name in its original form, as ‘in Craven’ was not officially added until 1937, although it had been used in various publications for several decades. The elegant Midland Railway lamp standards and the notice board bearing the company’s name will be noted. The fences are not of the distinctive Midland ‘diagonal’ style, and they and the crossing gates have been given a coat of brilliant white paint – perhaps in anticipation of this photograph being taken? 1894 1:2,500 OS Map. At this date the only building at Thornton station is on the up (north-west, Skipton-bound) platform; the station house would soon be added. The signal box (SB) and signal posts (SP) are shown as is a siding behind the up platform. The westernmost of the three tracks north-east of the station is for goods and mineral traffic, and at the northern edge of this map extract the siding diverges towards Thornton limestone quarry. There are no buildings apart from those connected with the railway on this map, and even today the station site remains isolated from Thornton-in-Craven village. 1894 1: 10,560 OS map.Thornton-in-Craven village, railway station and quarry are shown on this map. The station is about ¼-mile from the village, reached by a lane without any housing development. At this date the map indicates that the only building at the station is on the up (north-west, Skipton-bound) platform; the station house would soon be added. The signal box (SB) and signal posts (SP) are shown as is a siding behind the up platform. The quarry, named ‘Thornton Limestone Works’ is reached by a siding from the Skipton-Colne line which passes over the ‘Roman Road’, the old road to Skipton, before tunnelling under the present-day route to emerge at the southernmost extent of the quarry. Sidings for stone traffic branch from the line into the quarry. Click here for a larger version. 1934 1: 2,500 OS map (Survey 1909). The station has reached its fullest extent. It was not until 1937 that the suffix ‘in Craven’ was officially added to the station name, although it had appeared in various documents for several decades. The building on the up platform is shown with its internal divisions and it faces a small shelter on the down platform. The station house has been added since the map of 1894, placed close to the lane (Station Road) and north-west of the siding that serves the cattle dock. The siding continues beyond the northern edge of this map extract to diverge northwards to Thornton Limestone Works, as seen on the 1894 map. The signal box can be seen about 200yd north-east of the station; it is positioned midway between the station and the point where quarry siding curves away from the main line. The village cricket ground is adjacent to the station – and is still here in 2017. Photography of railways was prohibited for security reasons during World War 2, so pictures taken at that time are rare; however, local resident M N Clay photographed locos at work at Thornton-in-Craven. 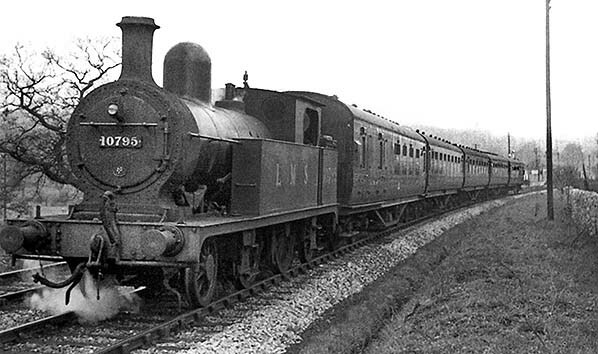 This view on 30 April 1940 shows a five-coach Skipton to Blackpool train near Thornton-in-Craven, headed by ex-LYR Class 2P 2-4-2T No.10795. The Aspinall-designed Lancashire & Yorkshire Railway Class LYR5 locomotive was built in May 1898 at the company’s Horwich works and carried LYR number 1378. At nationalisation in the loco would be shedded at 23A Skipton and given BR number 50795. She was withdrawn from 20E, Manningham shed, on 30 November 1959 and disposed of in June 1960 at Gorton works. 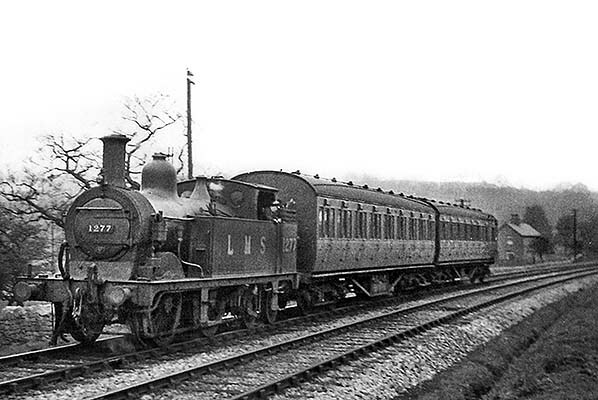 In April 1940 a push-and-pull set is speeding towards Thornton-in-Craven station (seen far right) propelled by No.1277, an ex-Midland Railway ‘1532’ Class 1P 0-4-4T. This Johnson-designed locomotive was built in May 1881 at the Midland Railway’s Derby works. She was withdrawn from 23A, Skipton shed, in May 1946 and cut up at Derby. 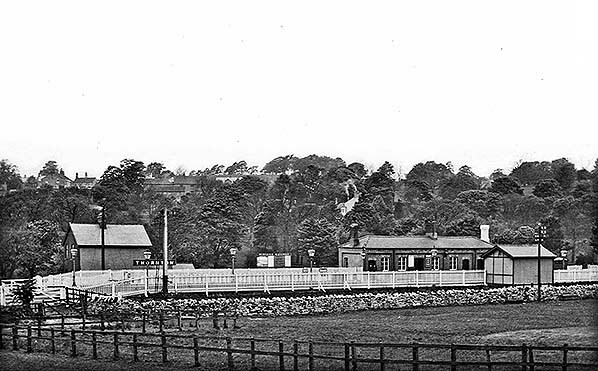 An undated view looking north-east of an up passenger train passing Thornton-in-Craven station. Part of an LMS ‘Hawkseye’ nameboard is seen far left. The station’s condition has deteriorated, with damage to the fences and the platforms and down waiting shed looking showing signs of neglect. The Midland Railway oil lanterns are of interest, with their casements set at an approximately 45° angle to the platforms. 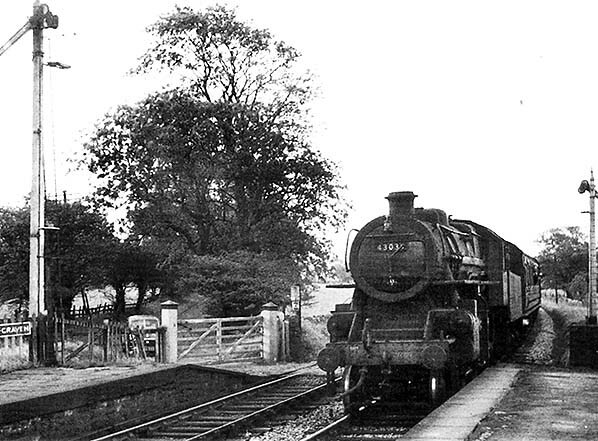 On 4 August 1956 Class 4P 2-6-4T No.42634 is leaving Thornton-in-Craven station on a Skipton to Manchester train. The lower quadrant signals will be noted. The Stanier-designed locomotive was built at the LMS Derby works in September 1938. At nationalisation in 1948 she was based at 24A, Accrington shed, and she remained in action until January 1965 when she was withdrawn from 10A, Wigan Springs Branch shed, to be cut up by Maden & McKee, Stanley, Liverpool the following May. A nine-coach Saltburn-Blackpool summer Saturday express is passing Thornton-in-Craven on 4 August 1956. Such holiday trains were a familiar feature on Britain’s railways until the mid 1960s when the combined effects of increased car ownership, holidays abroad, and the policy to withdraw them signalled in the ‘Beeching Report’ of 1963, drastically reduced their number. The loco is No.61030 ‘Nyala’, a Thompson-designed B1 ex-LNER 4-6-0 built at Darlington works in June 1947. British Railways prefix ‘6’ was added to the original LNER number 1030. Originally allocated to 51E, Stockton shed, at nationalisation, she was withdrawn in September 1967 from 25F, Low Moor shed, to be cut up by Garnham, Harris & Elton, Chesterfield, in November 1967. 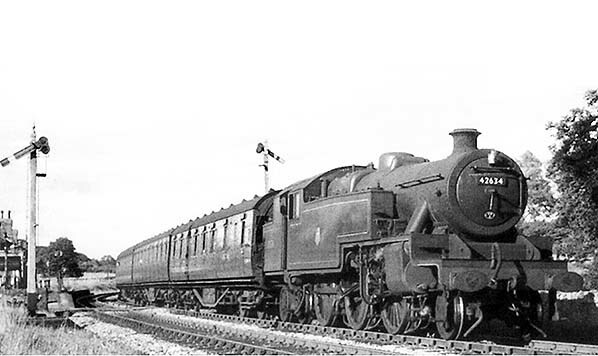 At Colne LMS/BR(LMR) motive power would replace this B1 with a ‘Black Five’ or similar to haul the train to Blackpool. The afternoon train would go through the opposite operation with the waiting B1 taking it into BR(NE) territory. An early morning local train from Skipton is passing over Booth Bridge Lane / Station Road level crossing and entering Thornton-in-Craven on 30 September 1957. An LMS ‘Hawkseye’ nameboard is attached to the fence, far left. Lower quadrant signals are still in place, both in the ‘Off’ position. The locomotive is Ivatt-designed Class 4F 2-6-0 No.43035 built at Horwich works in May 1949. She was withdrawn from 11D,Tebay shed, in November 1965 and cut up by Motherwell Machinery and Scrap. Inslow Works, Wishaw in February 1966. 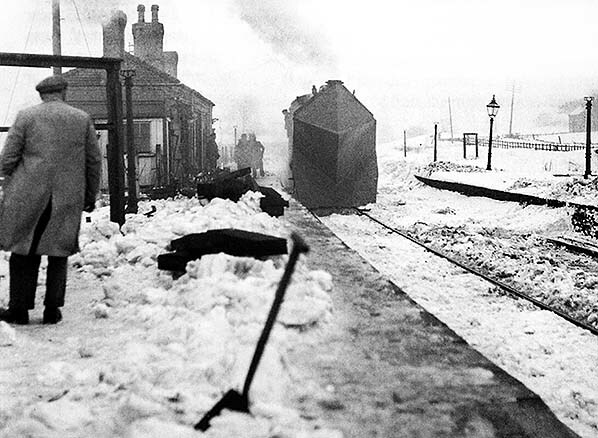 In early 1963 there was prolonged snow cover in much of Britain, and this evocative view north-eastwards on the up platform of Thornton-in-Craven station was taken during that period. A Skipton-based Class 4F 0-6-0 with snow-plough fitted is on hand, while a shovel is in place for clearing the platform. A few weeks later the ‘Beeching Report’ would list this station for closure, and it is already looking decidedly run down, with the empty LMS nameboard frame and decapitated lamp standards.